Nikola Tesla was one of the greatest electrical inventors who ever lived. His technological achievements transformed America from a nation of isolated communities to a country connected by power grids where information was available upon demand. In the 20th century, it was Tesla's technology that united the United States and eventually the world. Tesla's life was like a movie. It is the story of a brilliant and charismatic immigrant who rose to the height of celebrity with his amazing talent, and then was tragically undone by his own visionary ideas. The cast of characters includes: Thomas Edison, J. Pierpont Morgan, Guglielmo Marconi, George Westinghouse, Mark Twain and many more. A Serb by origin, his early discovery of the alternating current motor led him to America to seek a venue for his discovery. Here he developed the polyphase AC system of power transmission, which drives every home and industry in the country. He invented the Tesla coil to create high-frequency electricity, and with it neon and florescent lighting, radio transmission, remote control, and hundreds of other devices which are now an essential part of our everyday lives. 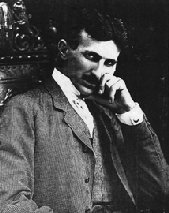 Tesla was also a visionary thinker, and in his papers and interviews he anticipated the development of radio and television broadcasting, robotics, computers, faxes, and even the Strategic Defense Initiative. Tesla's great dream was to find the means to broadcast electrical power without wires in between. But like many geniuses, he was not a practical man. He gave his life to realize his visions, while others made millions with his inventions. In the end, he wound up a penniless and forgotten man. In his later years, Tesla was regarded as an eccentric scientist. Ridiculed by his contemporaries, his ideas frequently appeared in works of science fiction. He was the inspiration for the mad scientist in Max Fleischer's Superman cartoons. At the height of World War Two, Tesla claimed that he invented a powerful "death beam" that could destroy attacking aircraft. He proposed a system of beam weapons to protect the borders of the United States and other European nations. When he died, most of Tesla's technical papers mysteriously disappeared, and many have not been found since. Tesla was so far ahead of his time that many of his ideas are only appearing today. His legacy can been seen in everything from microwave ovens to MX missiles. But more than this, Tesla's life inspires us to believe that anything we can imagine can be accomplished - especially with electricity. Cheap quartz watches came with an enormous omega replica sale performance gain over even very expensive mechanical watches, and the same thing applies today. Therefore, because traditional mechanical watches are much less accurate than mainstream replica watches sale quartz watches, I think that many traditional watch brands are almost embarrassed to advertise their accuracy ratings when the rolex replica uk accuracy of a $10 quartz watch will far exceed that of most any $1,000,000 mega-luxury timepiece. People in the watch industry often say that "people don't wear watches anymore to tell breitling replica sale the time." In a sense, that is true, because people no longer rely on their watches to tell the time given the rolex replica availability of easy-to-find clocks on the electronic rolex replica sale devices we carry – such as our mobile phones.